Originally from Brittany, Tristan Le Govic was only six years old when he began learning the Celtic harp at the Conservatoire of Traditional Music of Soye (Plœmeur). The attraction to music will never leave him. During his studies he gained numerous prizes and nominations that emphasize the recognition of a talented and accomplished musician. Performing on international stages, critics pronounce him as one of the leading Celtic harpers today. During his time living in Ireland, then in Scotland - where he was appointed Celtic harp instructor within the City of Glasgow - he developed a deep sense for Celtic music both in a solo repertoire or with big names of the music world. For the 30th anniversary of the Edinburgh International Harp Festival (2011), the harpist Corrina Hewat invited him to take part in the performing of her masterpiece The Song of the Oak and The Ivy with Mary Macmaster, Wendy Stewart, Heather Downie and Bill Taylor. Tristan Le Govic created his musical diversity by performing with other musicians such as the accordionist Samuel Le Hénanff, harpists Rachel Hair and Ailie Robertson or Enez trio, a band mixing Celtic music with jazz colors, founded with Stuart Macpherson (bass) and Roy Shearer (percussions). Introduced to the Nordic music by the Swedish singer Lise Enochsson, he developed a unique repertoire of Scandinavian music on the Celtic harp whose result was the recording of the CD Elva. Recognizable by his sense of rhythm and harmony, his style is popular among the public and critics alike. Singer, storyteller, virtuoso musician, he founded his repertoire in the tradition and also with his own compositions. In perpetual movement, his world opens the gates of an extraordinary diversity. For the public, he is an enchanter. He is the publisher of The Breton Harp Anthology, a unique collection of three music books featuring the best harpists in Brittany (Alan Stivell, Kristen Noguès...). Canadian harpist and composer Sharlene Wallace is a diverse musician performing, recording and teaching on both lever and pedal harps. Winner of the Lyon & Healy International Pop & Jazz Lever Harp Competition (USA) and the Dinan Concours d'Improvisation de Rencontres International de Harp Celtique (Brittany), she has given concerts and workshops across Canada, the United States, France and Italy. Sharlene's seven CDs express journeys of rhythm, spaciousness, the Canadian landscape, Classical, Celtic, South American and original music. Her most recent CD, In Night's Deep Silence, is a tranquil Christmas album for harp and bass (George Koller). As well as solo concerts, Sharlene tours with George Koller (bass) and the Christmas trio, Harp & Holly (Sandra Swannell and Terry Young). Sharlene continues to give workshops across Canada including annually at CAMMAC (Quebec) and Island Mountain Arts (BC). She also teaches both Celtic and Classical harps at Wilfred Laurier University, York University and University of Guelph. Her own harp performance degree is from the University of Toronto where she studied with the eminent Judy Loman. Sharlene has also been guest soloist on both Celtic and Classical harps with orchestras throughout Ontario. Sharlene is principal harpist with Guelph Symphony, Kingston Symphony and Oakville Symphony. 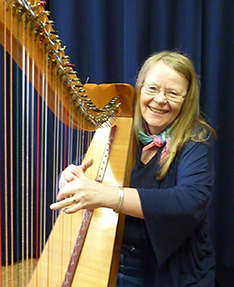 Playing for over thirty years, Marilyn teaches in her Harp Canada Studio in Duncan, Vancouver Island, and at the Nanaimo Conservatory of Music and is the founder of the Island Mountain Arts International Harp School. Since establishing herself on the Island, Marilyn has built up a very busy teaching schedule and is delighted to share what she's learned. Her students range in age from children to seniors, and are at all levels of study. Morag Northey has lived a balance of excellent training and experience in Cello Performance and String Pedagogy. Her philosophy is actively represented through her educational choices: a Masters degree from University of Calgary with violinist, music icon, and dedicated teacher; Tom Rolston, an Undergraduate Performance Degree with well-published master teacher and pedagogue Phyllis Young, where she worked five years in the University of Texas at Austin’s world-renowned teacher training String Project. Northey holds an Associate of Arts in Pedagogy and Performance from the Victoria Conservatory of Music and Camosun College with cellist and pedagogue; James Hunter, has completed the Toronto Professional Orchestral Training Program and attended numerous masterclasses and residencies at the Banff Centre under artists such as Zara Nelsova, Aldo Parisot and Tsuyoshi Tsutsumi. At an early age Northey studied cello with Judith Fraser at the Vancouver Academy of Music. A teacher for 35 years, Northey adheres to the technical demands of classical music while inspiring cellist of all ages and stages from rudimentary skills to successful entrance in the profession. She has trained in the Suzuki and Kodály methods, taught at the Calgary Suzuki Talent Education Society, consistently lead group and ensemble classes for early childhood, teen and adult levels, and for ten years created and ran a series of unique, multi-age, multi-level, all-encompassing intensive string summer boot camps. Northey is the Director of the Good Vibrations Cello Choir, an ensemble of adult cellists who rehearse weekly at Calgary’s arts-focused Garrison Green Seniors Residence, adding colour through sound to lives, one good vibration at a time!